Lengthy, dramatic nails can be quite elegant. Long red fingernails are eye-catching and glamorous, but they also require a fair amount of upkeep. Of course, any decent manicure should be well cared for, but dark, dramatic and extra-long nails require just a bit more attention. Just the idea of wearing red nails can be daunting to some women. The color is bold, bright and guaranteed to elicit at least some attention. One way to minimize the impact red nails might have is to wear them on short nails that are square and oval shaped at once (or "squoval," as it is often referred to). Others embrace the color fully and love its richness and femininity. Many may even choose to wear the color on long fingernails, which can also be quite intimidating to those who traditionally wear their nails short. The collaboration of red nail polish and long fingernails, though, is an endeavor not to be taken lightly. First of all, it's important to make a commitment to the amount of upkeep the color will almost definitely require. This applies to any dark color, whether blue, black, fuchsia or vibrant cherry red. Secondly, long nails do demand a certain amount of care, and it's important to treat them well to avoid breakage and long-term damage. Before you embark on an adventure with that bottle of fire engine red nail polish, you might want to consider your lifestyle. If your job requires you to use your hands frequently - perhaps you're a cashier, a freelance writer, or a typist - you may find it difficult to maintain dark polish without dealing with regular chips and nicks. Long nails can also be tricky (though not impossible) to maintain with certain jobs. If your nails frequently take a beating simply as a result of your everyday activities, you may be better off opting for a short manicure and pale colors. Correct small errors with a cotton swab. Keeping your red nails fresh for more than just a few hours starts with a great manicure. If you do your nails at home, make sure you prepare them for color properly. File the nails gently from the outside in. Avoid the temptation to roughly scrape back and forth - this can cause damage or even break long nails. Buff the nails equally gently, from bottom to top. Treat the cuticle area, pushing it back (again, gently) with an orange stick. Wash your hands to remove any oils from the nails. Next, it's time to apply the nail polish. This, of course, always requires some attention, but is even more important when the color is extremely dark. Even the smallest gaff will be noticeable if the color is not properly applied. However, don't worry if you do accidentally brush your skin or apply a bit too much. 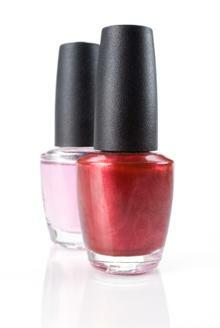 A cotton swab dipped in nail polish remover can easily remedy any minor errors. Apply a quality base coat. Not only does this prevent the nail from staining, it also events out the surface and acts as a foundation for the actual polish. Best of all, it helps maintain the life of the color. Apply two coats of polish, keeping it relatively light. A thick coat will cause air bubbles to form. Finish with a top coat, which will seal the color in. A top coat seals in the dramatic color. Wear gloves when you're doing anything that might harass the nails, like gardening, playing sports, doing the dishes and coloring hair. File and buff them regularly. This will promote healthy, long and, most importantly, strong nails. The stronger they are, the longer they will actually stay long! If you're maintaining your long fingernails and still suffer a break or chipped polish, you can probably fix it if the problem is minor and does not impact more than one nail. A cotton swab dipped in nail polish remover will help. (Be wary of other problems, though: If you've broken a few nails over time, for example, it's best to just start from scratch and allow them to grow again.) Using a nail hardener can assist in minimizing chips and will help the nail polish adhere longer. A product that is rich in nylon fibers is especially effective. Before you take the leap and attempt to grow you nails long and paint them a bold red, remember that you'll need to take the extra time to care for them. There are no shortcuts that will keep your nails in great shape, but the more effort you put into maintaining them, the longer your fabulous manicure will last.